Home Android Phones Google Nexus 10 Google Nexus 4 Google Nexus 7 When Will Google Nexus 4 8 GB and 16 GB be aviable in US? When Will Google Nexus 4 8 GB and 16 GB be aviable in US? This question is haunting me ever since I landed here and still could not book one. However there is a good NEWS. How about you could get an alert when its available? Yes there is an Android App which does exactly that. The name of the Application is Nexus 4 Stock. 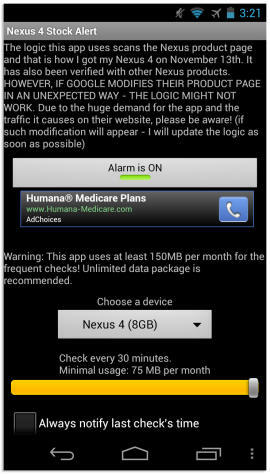 It periodically checks Google's website for updates and if it finds the device available it simply Alerts you. You have to simply configure which Nexus Device you are really interested in Buying and start tracking imminently. 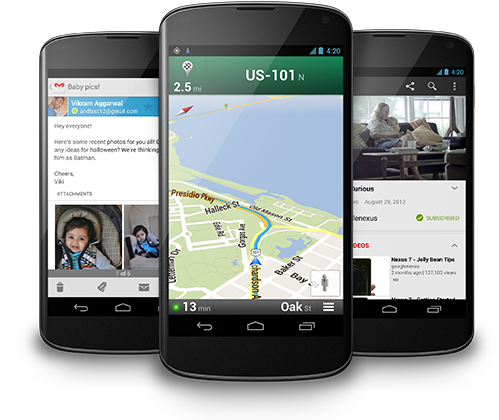 You can choose all versions of Google Nexus 4, Nexus 7 or Nexus 10 for tracking. Now there is no need for you to really go to the website every day and check if the device is available or not. I know I am increasing my competition but for the love of Android I am doing it. The other day I was lucky enough to have a look at it and of boy its a great device.